In the early 90’s, Cady Noland’s work was concerned, among other things, with US American culture’s assertions of superiority and the power relationships that result from this. “She reveals the great myths of America, shows how they are mirrored in consumable items, and transforms them into sculptures simultaneously aggressive and playful”. 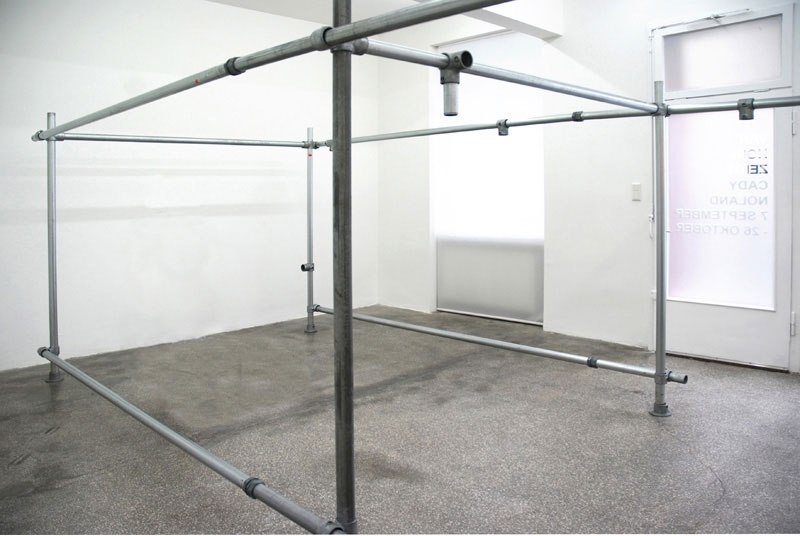 As a female artist she picks up macho metaphors and produces hard, testosterone-saturated works. Power relationships within the art world are precisely interrogated. Her powerful interactions with the male-dominated public art world are positioned as sculptures in the space. The promises of freedom and happiness found in cheap myths of truckers and cowboys are reproduced ad absurdum as art hardware. In the 2000’s Cady Noland’s work is more relevant than ever. The conservative backlash in America has also strongly affected the art world, which is daily confronted with the need to rethink its Western worldview. Wilhelm Schürmann has selected three works from his collection for this exhibition: “Truck Rack Blank”, “Open Sore, the 5 & 10 c Store” and “Chainsaw Cut Cowboy with baked beans”. 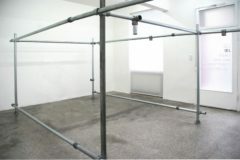 “Truck Rack Blank” is the raw skeleton of a truck body and has the measurements of a typical overseas shipping container. Standing in the space like a minimal scaffolding of trucker legends, “Truck Rack Blank” seems like a carcass of the promise of transportability: everything can be transported. Everything is placeless, also art. The product art. The work itself remains unmoved. 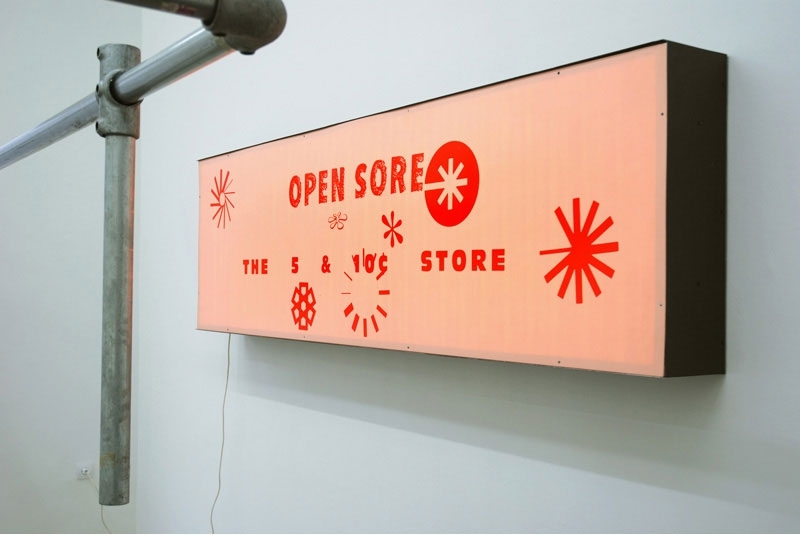 “Open Sore, the 5 & 10 C Store” is a large light-box, like the ones used for advertising hoardings. The pun with Sore and Store is not a coincidence. In the global art market everything is always available, everything for sale. It is here that art is vulnerable. The works in the exhibition are not for sale.